Now come the repli-planes. For years the auto industry has been plagued by kit cars that turned a Ford Pinto chassis into a 'Bugatti' or other classics like a Mercedes roadsters. This is beginning to happen in aviation but the planes are more than cosmetic clones, and some of them are downright interesting and fun. At Oshkosh, and with the appropriate wild look in my eye, I used to delight in shocking owners of Staggerwings by asking, "Say, can you build this out of fiberglass with a VW engine?" Now someone in Alabama is building a modern Staggerwing design called the Lionheart of composites, but with six seats and a Pratt & Whitney engine. The Russian Technoavia Finist is a modern Beaver that looks like a promising design, and now there's a Rotax-powered replica of the Fiesler Storch being offered as a kit in Australia. Drug runners. "After deciding to build a timber aircraft over 6 years ago, a check of local regulations revealed that Australia wouldn't allow the use of acid-catalysed glues in primary structures. Although I wasn't able to use Aerolite, I had to find out what we were missing and proceeded to have Aircraft Spruce supply some. Being basically quite mean, I had to find a way of getting it here. The package of glue was delivered to Oakland, CA, for my brother, David, to bring on his next trans-Pacific delivery. He was present when I finally opened it, and I saw him go sort of pale. The aircraft he had flown in was an agricultural Aries (yes, 90 knots to Hawaii and beyond) with precious little cockpit for an extra parcel, so he taped it above the control cables in the fuselage, then promptly forgot it until Brisbane when customs expressed an interest in what was inside all the hatches! Fortunately, it was dark and the customs man had mislaid his glasses so David didn't go to gaol that night-you see, the white powder of the Aerolite had been packed in an unbranded plastic bag inside an unbranded box. It's not difficult to imagine the glee of a lawman thrusting his finger or, more likely, tongue into the undisclosed powder." Media watch. See the Feb/Mar issue of Air & Space for 'Ollie, Mu'mmar and Oysters' about our invitation to Col. Qadhafi and later in the issue there's a piece by Steve Wilkinson about taking his Falco to a fly-in breakfast. In the next issue, Steve lives out a school boy's fantasy, comes out of the sun to buzz the the 40th class reunion of his old school, streaking down the length of the football field, interrupting the homecoming game, and whistles off into the distance snubbing the whole affair. Burn it, but Lordy don't think about flying in it. In the April issue of Car magazine, this is what the erudite and opinionated L. J. K. Setright has to say: "Wood is quite dreadful stuff. It splinters, it warps, it shrinks; it creeps, it splits, it swells, it cracks; it reacts badly in some ways to moisture, badly in other ways to dryness, badly in yet other ways to light, to heat or to infestation; and it may do any of these things, or many of them in crazed combinations, even when left entirely alone. What it does under stress is quite dastardly, frequently treacherous and generally incalculable. There are, I admit, savants of materials technology such as Professor J. E. Gordon, one of the very best technical writers -- who applaud wood as 'nature's composite' and infer all manner of useful lessons from it; but even he, being a person who admires boats, must be suspect. Wood is excellent for making trees, but is otherwise not to be trusted. Wood is not an engineering material." Bored with Falco building and want to take on new challenges? Then order a copy of "The Teach Your Chicken to Fly Training Manual" from Ten Speed Press, P. O. Box 7123, Berkeley, California 94707. It begins with the 'history' of a group of visionary Californians who, during the period of 1940 to 1953, took sympathy on the plight of flightless chickens and decided to do something about it. 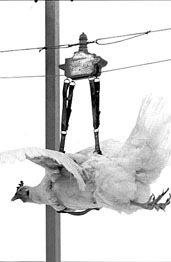 They formed The Society for Rights for Inferior Birds, and invented an exercise machine to teach chickens how to fly. A complete Construction, Instruction and Training Manual was issued with each machine, complete with engineering drawings for the chickens as well as the exercise machines. The birds were supported in a leather harness, and suspended in flight attitude from a wire while they are wheeled back and forth. Below them cutouts of cities, trees and farms so the chickens will know what they will see when flying. There's an entire chapter on the pyschology involved and the use of audio-visual material so the chicken can hear the sounds of flapping wings and see other birds flying to the side. There's even a painting of Sigmund Freud with a chicken, indicating his interest in these birds which gave rise to the now widely used term "Freudian Chic." As with anything from California, there's instruction on how to massage the wing muscles of your chicken. From Airlines Magazine: "The average pilot, despite the sometimes swaggering exterior, is very much capable of such feelings as love, affection, intimacy and caring. These feeling just don't involve anybody else." Top Gun and Bottom Gun. To our erudite list of readers, the Falco Builders Letter now adds actor Tom Cruise, since the original 'Top Gun' pilot now flies an SF.260 in his spare time. Cruise is originally from Louisville, as is George Barrett (hereinafter known as 'Bottom Gun'), whose sister-in-law is Tom's aunt. We just want Tom to know that he's welcome around these parts. Tired of high prices from Sequoia Aircraft? Rejoice, now there's a second source on engine mounts. Aircraft Spruce now lists Falco engine mounts in their catalogue, each made to order and without hardware or Lord mounts. There is, um, just this one little problem -- their price is 24% higher then our normal kit price! If you want to buy the engine mount alone, please let us know. At the annual PFA Cranfield bash, Stuart Gane's Falco made its debut in finished form (there in primer paint last year) and scooped the Best Plans-Built Aircraft (effectively Grand Champion) award and the Pilot Trophy Concours d'Elegance (Pilot actually plays no part in the judging of that). Oh, what a beauty! Red with white trim, like the Norwegian one, with a surface finish you could easily use as a shaving mirror. Now we are 50. The 50th Sequoia Falco flew on September 10 at the hands of owner/builder/pilot Richard Clements. The test pilot's verdict: "Magnificent". Just ease back on that stick. Stelio Wilkinson was in Florida recently and flew the Antonov AN-2, the huge Russian single-engine biplane 'airliner', which he says flies like a steamroller. The flight manual says that in the event of engine or instrument failure in IFR conditions, you are to drop full flaps, haul all the way back on the yoke and hold it there. It won't stall, ever, and it will descend at parachute speed and 20 knots. You're supposed to just wait for it to hit the ground. BD-10: 2, Presidents: 0. It's been tough sledding for Peregrine Flight International, of Minden, Nevada, which is developing the Peregrine PJ-2 based on the Bede BD-10. On August 1, a crash in the aircraft claimed the life of the company president, Joseph Henderson, an accident suspected to be caused by flap asymmetry. The previous company president, Michael Van Wagenen, was killed on December 30, 1994 in an accident caused by structural failure of the tail. This could get to be discouraging. Bozos without Limits. No ones knows what really happened when Bob Herendeen was killed in his Christen Eagle aircraft. He was taking pictures of his home and crashed into a hillside. Friends speculate that the crash might have happened from 'momentary inattention.' The crash caused a brush fire, and a contractor who was building a house nearby jumped in his truck and headed for the crash site. On his way, he hit and killed a real estate broker who was nailing up a sign. The contractor was arrested and found guilty of vehicular manslaughter and other charges. But then Herendeen's widow and his estate were sued for the death of the real estate broker, because the complaint charged that the widow and the estate "did so negligently and carelessly own, occupy, operate, maintain, manage, control and entrust the [aircraft] so as to cause said aircraft to crash, creating an emergency to which [the contractor] was responding as rescuer. [The contractor's] vehicle left the roadway in the course of the rescue, striking decedent and thereby causing fatal injuries and damages to him." The case hinged on whether the harm to the real estate broker were reasonably foreseeable. The judge in the case dismissed the suit prior to trial. Media watch. Keep an eye out for the December issue of Automobile magazine for an article by Robert Cumberford on Stelio Frati.